A living language is an indication of a living civilization, and a living civilization is evidence of a people with an identity, culture and actively spoken language. 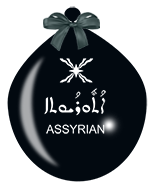 The Aramaean-Syriac identity is one such living civilization, however, the so-called “Assyrian” identity is not. It is academically inaccurate to label ‘pseudo-Assyrianism’, which today falsely represents a non-existing people in the pages of history. Furthermore, the city Edessa, in Syriac/Aramaic ‘Urhoy’, today’s Urfa, which is situated in the southeast of Turkey and was the capital city of the small Aramaic kingdom of Osrhoene. It was historically the meeting point of Greek and Aramaic cultures and it is known as the ‘Cradle of Syriac Christianity’, due to the strong foundation of Christianity it held and the influence it had on its development. An important figure who was highly influential to Christianity at Edessa was King Abgar V, who reigned from 4 B.C to 50 A.D. There is a famous legend which is attributed to King Abgar V which plays an important role to the development of Christianity at Edessa. The legend has been reported in two primary sources, both of which date back to the 4th century, and which have most likely been derived from oral traditions. Firstly, there is the Historia Eccesliastica (H.E. ), which is the two letters of Abgar and Jesus found in the city archives, translated from Syriac to Greek, reported by Eusebius the bishop of Caesarea 263-339 A.D. ‘Eusebius H. E. 1.13 records the story of Addai, one of the seventy-two disciples, who had come to Edessa from Palestine in response to a letter from King Abgar to Jesus,’4 The reliability of this historical record is affirmed by the second primary source which is known as the Doctrina Addai, written in Syriac and was most likely written in the end of the 4th/5th century. The author of the Doctrina Addai is anonymous, and it contains the exchange of letters between Abgar and Jesus in Syriac, the arrival of the Apostle Addai to Edessa, as well as Addai’s preaching and conversion of Edessa. In addition to this, it also includes a detailed account of Addai’s preaching and conversion of the heathen priests,’5 The importance of the historical records of the legend plays a central role in the origins of Christianity in Edessa as they are both primary sources which authenticate the correspondence between Jesus and Abgar. The Aramean-Syriac people are the first and oldest living Christians in Mesopotamia. As a result of increasing the population, political effects, external pressures, worldly expectations and many other reasons, different denominations were encouraged within the Aramean populace. Unfortunately, there are still some efforts to create yet another denomination under the name of ‘Assyrianism’ within the Syriac Orthodoxy. Although the basis for many of these divisions may be Christo-Archeological, in the background the divisions bear reasons of false ethnicity and identity. A sinister project has been played on Syriac people as it divides the community and differentiates it from within. It is deeply shameful that the Aramaeans are today yet again facing an ethnic challenge, undermining, and confusion, with the “Assyrian” name politically rather than ecclesiastically imposed on them. The concept of “Assyrianism” first emerged in 1836 in Iraq, which just over a century later resulted due to an intra-church schism in 1968, divided the Church of the East, and adopted the name the Assyrian Church of the East, and moved their headquarter to Chicago, USA. These group keenly adopted an illusory misnomer to a dead civilization – the “Assyrians”. 1) Inscriptions written in Aramaic (some of them are written by rulers of small kingdoms). 2) Annual records kept by the Assyrian kings showing their campaigns against Aramaean Kingdoms. 3) The section of "Samuel, Kings and Chronicles Books" in the Bible. The evidence based in these documents clearly illustrates historical and documented evidence that these two nations (the Aramaean and “Assyrian”) have never been misidentified or merged together until nowadays. In fact, throughout history, as a result of the hostility and polarization which occurred between them, the Aramaean-Syriac community was never identified as ‘Assyrian’ and vice versa. Only during a certain limited period of time in history, did these two communities live in the same geography with both positive and negative relationships with each other. Indisputably, all trusted historical documentation demonstrates that the “Assyrians” have been obliterated from history since 7th century BC. The opposite is true regarding the Aramaeans, who still continue their demographic presence through their Syriac descendants. The dominant language and culture of the Aramean/Syriacs is ‘Aramaic-Syriac’, which was the language of the Armaic Kingdom Edessa, which is supported by several survived inscriptions in the city, dating back pre-Christianity.7 Those who speak this language carry the identity ‘Aramaeans/Syriacs’. Today, the segments of different church denominations, who call themselves “Assyrians”, use the ‘Aramaic-Syriac’ language, and hence keep its culture alive. In fact, this in itself demonstrates the fact that "they deny their own existence...". Had there been an Assyrian culture, then where is the language that belongs to this culture, and why is it not consulted to be kept alive? How is it possible to build or enliven the Assyrians, a dead civilization, and override with modern technology a living and thriving Aramaean-Syriac identity, culture, faith, and language? If the Syriac (Aramean) people of today are the descendants of the “Assyrians”, then why is the culture of the Assyrian people not enlivened, and why is the Assyrian language no longer spoken? 2. S. Moscati, Ancient Semitic Civilizations (New York, 1957), p. 179. 3. www.suryaniler.com, Erişim Tarihi: (08.01.2015). 4. Barnard, L. W, The Origins and Emergence of the Church in Edessa during the First Two Centuries A.D., 1968, p.162. 5. Schneemelcher W., New Testament Apocrypha, 1991, p.493. 7. Han J.W. Drijvers and John F. Healey, The Old Syriac Inscriptions of Edessa and Osrhoene. Texts, Translations and Commentary, Brill 1995.